Posted September 24th, 2017 by Mike Boyes & filed under Early Social and Emotional development, Families and Peers, General Psychology, Health and Prevention In Aging, Human Development, Stress, Stress Biopsychosocial Factors Illness, Stress Coping - Health, Stress: Coping Reducing. Description: I am not prepared to offer any sort of political comments on the current rhetoric being thrown back and forth between American president Donald Trump and Korean Leader Kim Jong-un. What I can do is recommend an insightful piece by Daniel Keating about the impacts of stress and anxiety on us that arise from the sort of bombastic, non-diplomatic diplomacy of The Donald and the supreme leader of North Korea. Before you read the article think a bit about what you may already know about the human stress response (short and long term) and about your own stress related issues and anxieties. As neither President Trump nor Kim Jong-un are within our control (at all, in any way, whatsoever!) 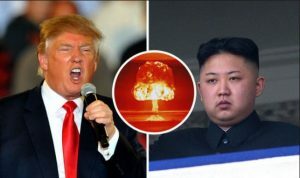 what might we or should we do to manage any feelings of stress and anxiety we may be experiencing these two odd people play nuclear hardball? Source: Cartoon Villains, Stress, and Health: Kim and The Donald, Stressful Lives, Daniel P. Keating, Psychology Today. SO do you feel better or worse now that you are somewhat better informed about the details of the stresses and anxieties associated with the uncertain possibilities of nuclear events in the world? Daniel Keating, being a developmentalist, links the stress response not just to its physiological roots but also to our developmental histories (right back to our pre-natal history) showing or reminding us that our current reactions and feelings are linked back to both our physiology (genetics) and our developmental experiences. He also points out the positive impacts of resilience factors (things that we do or things that are around us) that mitigate the impact of stress situations and events and, potentially lessen anxiety levels. It is worth noting that recent work on resilience encourages us to be cautious NOT to view resilience simply as a sort of individual trait (like character strength) but to recognize the ecological nature of resilience. This approach to resilience would suggest that individuals will do better if we can create cultures or environments supportive of positive stress and anxiety reducing habits and life-style suggestions….. something the current political players in this nuclear standoff are most definitely NOT doing. So, as is often the case, it is up to us (and to psychology) to work at making a difference at the individual level. Good Luck! How to events like the rhetorical salvos being fired back and forth by Trump and Jong-un impact us in terms of stress and anxiety? What sorts of resilience related actions and habits can we work on in order to better manage the impacts of relatively uncontrollable impacts of world events (especially of the number and magnitude we are currently experiencing)? From a psychological (well-being) perspective what is wrong (well what is challenging) about Trump and Jong-un’s forms of “diplomacy”? A final broad question to consider is to think about the similarities between the above circumstances and Pascal’s wager. Keating, Daniel (2017) Born Anxious: The Lifelong Impact of Early Life Adversity — and How to Break the Cycle, New York, NY: St Martins Press.